Josh Eichorn: Has decided to DO something with his life—Spend it in front of the TV eating Cheese Doodles and watching reruns of Mama’s Family. She-Dragon declares that Dragon cannot possibly be dead but William Jonson disagrees, talking about how Abner Cadaver dissolved him into nothing. Barbaric picks up the head of the villain and crushes it into powder. Rock berates his teammate, pointing out that his status as one of the undead meant that there had been a chance for them to restore him and have the spell that killed Dragon reversed. The power gloves are reclaimed by She-Dragon but one of them is snatched from her grasp by Vein who is still inexplicably loyal to Horde. She attempts to escape but She-Dragon swiftly renders her unconscious. Alex Wilde surveys the dead leeches and states that although Horde is dead, she is positive that she saw someone else that had been hidden beneath all of the leeches. Frank Darling does his best to comfort Alex as the death of Dragon finally overcomes her emotions. She-Dragon points out that Dragon may regenerate from his severed arm or perhaps they could clone him but this false hope does little but upset those around her. 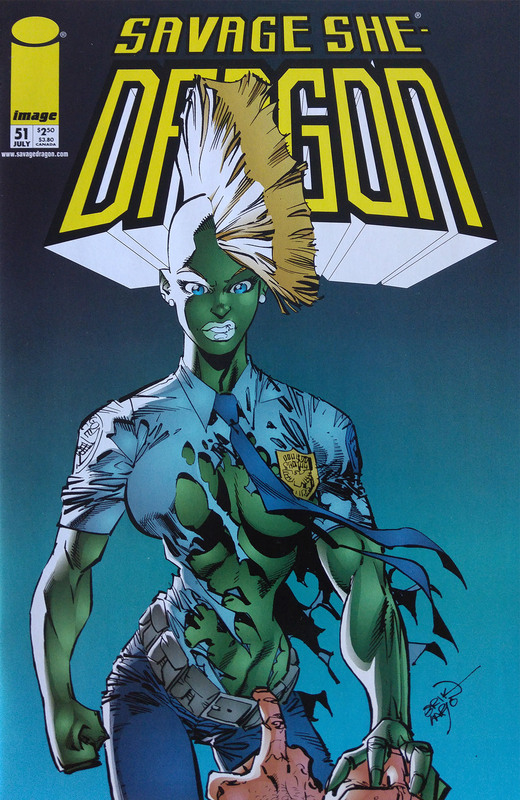 After she returns to her apartment, She-Dragon is surprised to find Chris Robinson inside who introduces her to his brother, Bludgeon. He was the person that she had Chelsea Nirvana transform during the Gang War when she was in possession of Johnny Redbeard’s powers. She-Dragon is asked about her creator’s history and she recites her own origins. Amy Belcher’s mother died as she gave birth to her which meant that her father resented her from the moment she was born. He abused Amy both physically and emotionally all her life and when she turned fifteen, Amy was admitted to hospital. Her father had been hit with a strange chemical during the Vietnam War and it passed onto her, leaving her deathly ill. Redbeard chose Amy to become one of his creations and she was transformed into Sensation. Sensation acted as a kind of play-thing to Redbeard but he ended up being similar to her father in terms of abuse. When she began hearing voices in her head, Redbeard grew tired of Sensation and severed their relationship. Sensation continued to communicate with the Eternal Youths of Darkworld and eventually joined up with other cast-offs in forming the Nixed Men. They were soon arrested by Dragon and sent to prison. The mental issues that Sensation suffered meant that she got psychiatric help and when the voices stopped talking to her, she was released. 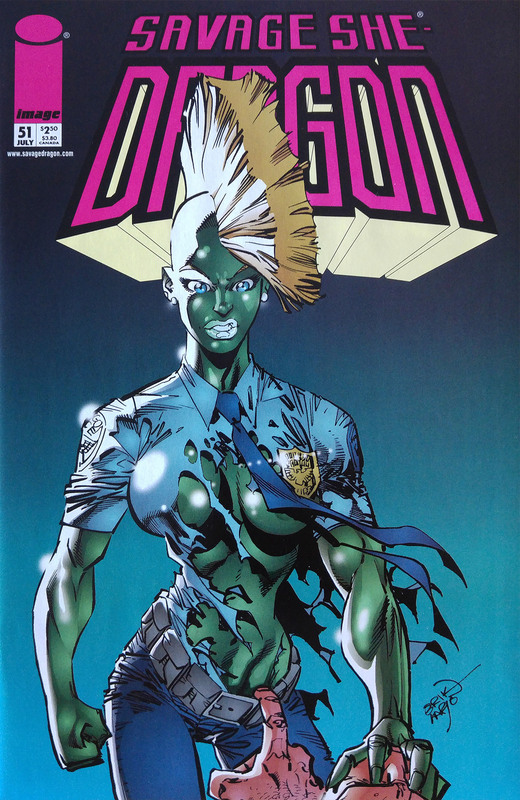 Sensation took on the name She-Dragon and tried for months to join the Chicago Police Department. This goal was eventually realised when Captain Mendosa hired her to be an incompetent replacement for Dragon but Chris’s training helped turn her around. Despite Mendosa being kicked off of the force for corruption, She-Dragon was allowed to remain. With the story ended, She-Dragon suggests that if Bludgeon no longer wishes to have his powers then he should seek out his old teammate Negate. This advice is ignored and Bludgeon unhappily departs. A funeral service is held for Dragon where many of his friends attend to pay their respects. Alex informs Smasher that Dragon truly loved her and that he wanted to say something to her back when they were travelling in space. He opted out of saying anything as he felt it would have been inappropriate given the circumstances. Mildred Darling comforts her husband and points out that if it was not for him then Dragon may have never gotten a chance of a decent life. SuperPatriot blames himself for the death as he had decided not to accompany the S.O.S. to Chicago to protect Dragon. Ann Stevens bids farewell to Dragon before Barbaric approaches her and states that her decision not to join the S.O.S. seems like a wise choice now. Ricochet is upset that Dragon never even got to meet her baby girl while Horridus is upset simply because another nice person has died. Kill-Cat takes the opportunity to offer his condolences to Dart over losing her legs before spoiling the moment by commenting on Rita Medermade’s breasts. Rita has to shut William Jonson up as he becomes increasingly paranoid that his brother would choose this time to kill them both. Zeus summons his beloved son to his throne room where he outlines to Herakles an important mission that must be carried out for the Elder Gods. He has two months to assemble a team to seek out any offspring of the Gods and return them to Godworld to live. It has been decided that their presence on Earth is a form of interference in mortal affairs and this situation must be resolved soon. She-Dragon nervously tries to ask Chris Robinson out on a date but her babbling eventually prompts Chris to ask the question for her. As the two chat together, Alex watches on with disappointment but William points out that she broke up with Chris and she should leave it alone. She-Dragon is shocked to discover that the Eternal Youths still live as they enter the precinct in search of her.